Meeting with the guide, after breakfast at the hotel where you are staying. Our direction will be the High Atlas through the de Tizi'n tichka Pass (2260 m.) Along a mountainious road full of small villages and waterfalls. Tiz'n Tichka means in the local language "neck pastures" and the path is particularly impressive, with a landscape that constantly and a succession of colors that makes it even more dramatic changes. 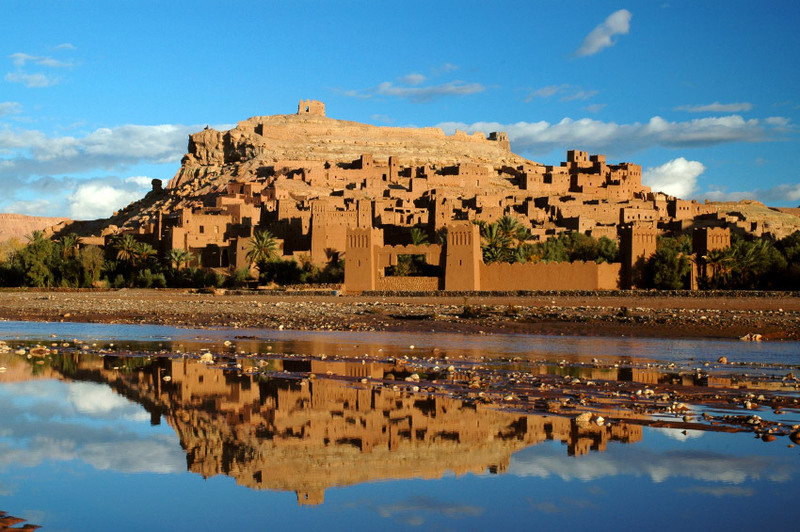 A stop for mint tea gives you the opportunity to savor the beauty of the environment, before arriving at the Kasbah of Ait Ben Haddou, where we stop for lunch. This village built entirely of adobe, namely straw and mud, was included in the World Heritage List of UNESCO. It is also very popular with Hollywood has chosen for filming international movies such as Gladiator, Babel, Lawrence of Arabia, and many more. 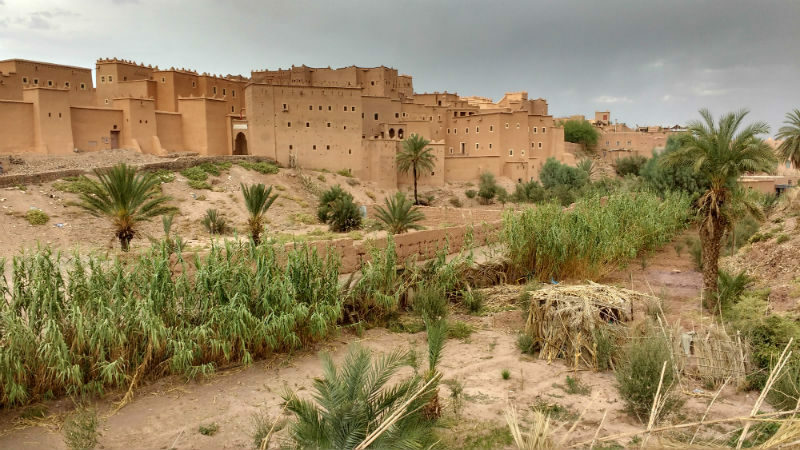 Then we go back to Ouarzazate before continuing our journey to the valley of a thousand Kasbah, came to the Dades valley, dinner and overnight stay in a charming hotel. Dinner and overnight. After breakfast, there would be a walk in the Dades Gorge, we will then take the car to travel the road of a thousand Kasbah, through the village of Tineghier with its Jewish quarter, to reach the Todra in time for with a stop for lunch. 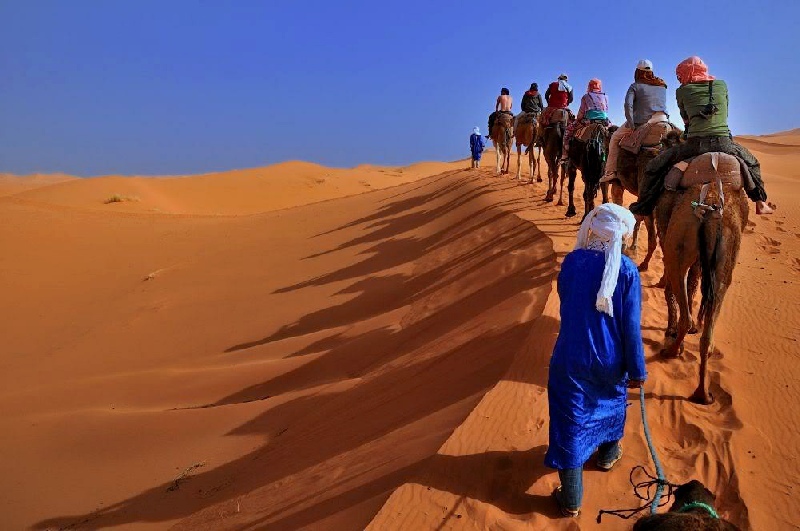 A walking tour in the grooves will discover the beauty of the surroundings before continuing his journey through the desert of Merzouga via Rissani and Erfoud. 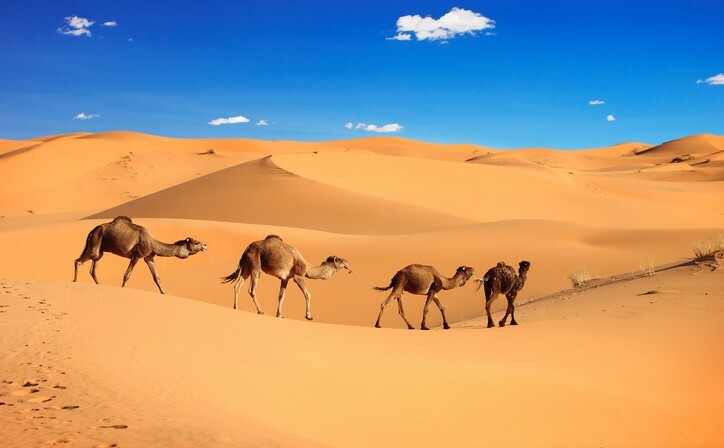 We arrive in time to leave the car and go by camel, to reach the foot of the dunes of Erg Chebbi, to spend the night in a Berber tent in the well-equipped camp where you could take a typical dinner at the rate of Berber drums and chants. With a little luck, if the weather permits, you will be able to see the Milky Way in the sky. The next day, the next day a morning awakening is desired to watch the sunrise from the top of the dunes, near the border with Algeria. Then, still a camel falls to the hotel. After breakfast we will start to visit Rissani, the old Sijilmassa, the economic capital of Morocco where caravans once went to deliver the goods everywhere, Shortly after, back to Ouarzazate, this time from 'a different direction from the first step through the village of Kob and the Draa Valley. then we will make a stop for tea and a visit to Agdez. 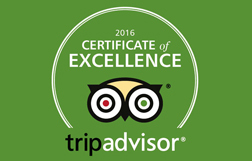 We arrive in Ouarzazate, where you can dine and spend the night in a romantic riad. 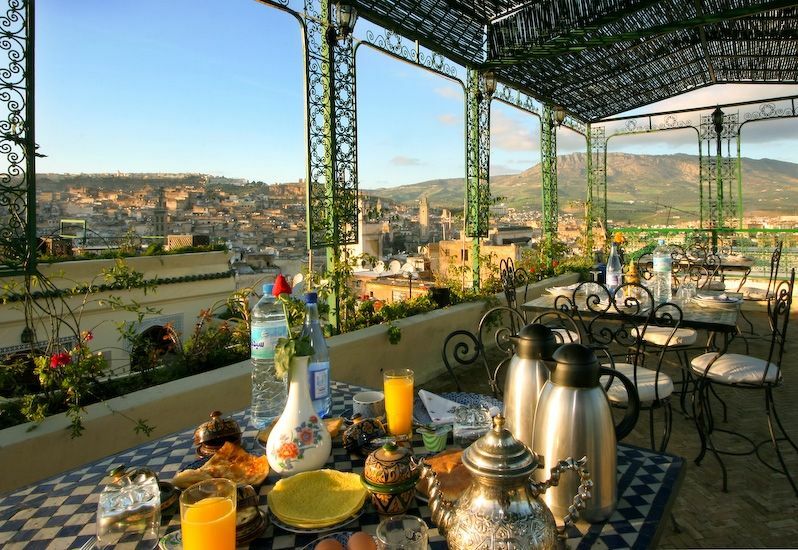 After breakfast, we will visit the city of Ouarzazate, the Kasbah Taouirt and movie studios Atlas Studios, the largest and most famous of all Africa. From there, we headed to the oasis of Fint, near Ouarzazate. Then continues through the neck and tichka for lunch in a small village. 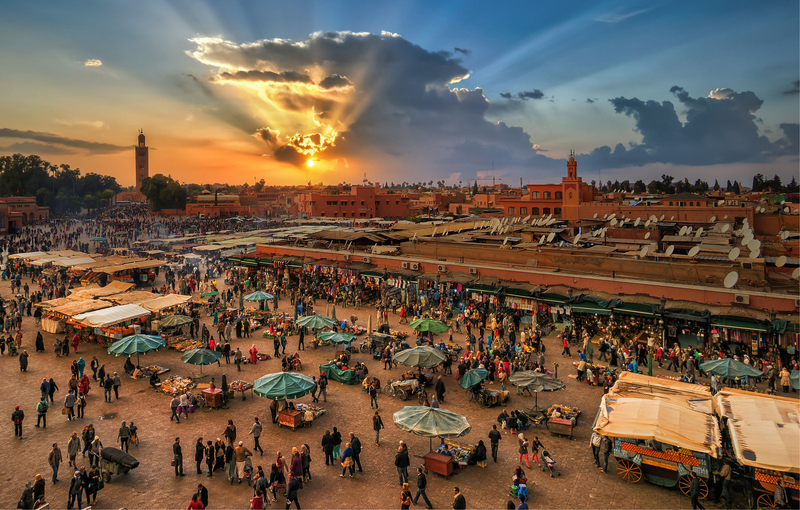 Then you will come to Marrakech late afternoon. "desert tour for 1 night "
Nomade experience: one-night trip to Zagora The road through the mountains was amazing. The views were incredible and indescribable. We made differents stops on the go at different spots as we liked to make pictures. The camels were waiting for us as we arrived in Zagora to bring us to the place where we would spend the evening. The people were very nice and hospitable. We ate, listened to music by the campfire under the stars. The peak of the trip was the camel ride in the morning during sunrise. It was an unforgettable experience! We had a lot of fun with the driver. It was very nice to have our own driver and car to make the trip as we wished.